One of the television's most popular series, the groundbreaking Combat! offers a gritty, unflinching look at American soldiers battling in Europe during World War II, confronting imposing odds and demonstrating remarkable levels of ingenuity and courage. Vic Morrow and Rick Jason head a stellar cast in the longest-running war series in history. 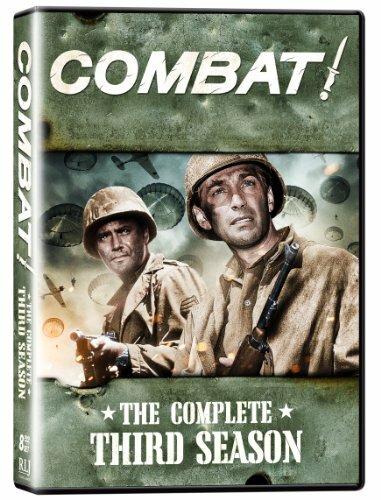 Image Entertainment, an RLJ Entertainment (NASDAQ: RLJE) brand, announces the release of the complete third season of TV's longest running World War II series Combat!, available on DVD on June 4, 2013 at an SRP of $39.98. One of the television's most popular series, the groundbreaking Combat! offers a gritty, unflinching look at American soldiers battling in Europe during World War II, confronting imposing odds and demonstrating remarkable levels of ingenuity and courage. Vic Morrow and Rick Jason head a stellar cast in the longest-running war series in history, featuring an incomparable list of guest stars from Hollywood's Golden Age as well as top directorial talent including Richard Donner and Robert Altman. includes all 32 episodes from the third season of this groundbreaking, classic TV series! Episodes: The Silver Service, The Long Walk, Mountain Man, The Duel, Vendetta, Dateline, Operation Fly Trap, The Impostor, Losers Cry Deal, Point of View, Brother Brother, The Hard Way Back, The Little Carousel, Fly Away Home, A Rare vintage, The Enemy, A Gift of Hope, A Walk with an Eagle, Birthday Cake, The Cassock, The Town That Never Went Away, The Convict, The Steeple, More Than a Soldier, The Long Wait, The Tree of Moray, A Cry in the Ruins, Heritage, The hell Machine, Billy the Kid, Beneath the Ashes, Odyssey. Bonus features include Audio Commentaries, Photo Gallery and Oddities & Bloopers.